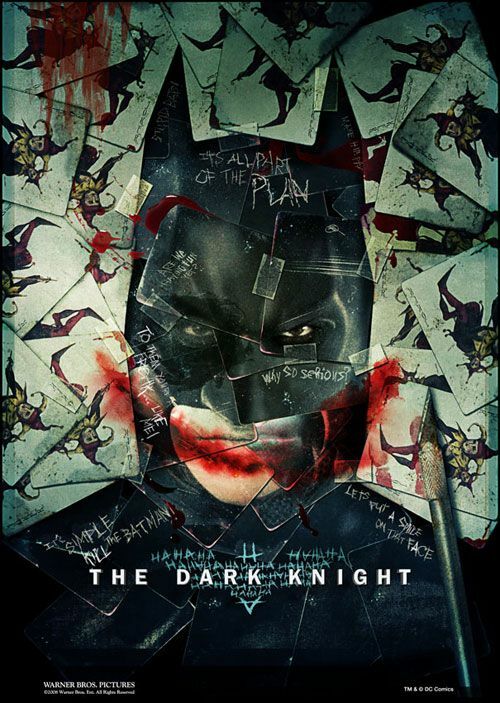 The Dark Knight is an incredible film production. Christian Bale reprises his dual role as Bruce Wayne and The Batman. Michael Caine returns as Alfred Pennyworth. Gary Oldham is promoted to Commissioner James Gordon. Morgan Freeman is back at the helm of Wayne Enterprises as Lucius Fox. However, Rachel Dawes is now played by Maggie Gyllenhaal. Batman faces off against his arch enemy The Joker. This is the definitive cinematic Joker. Ledger's performance as The Joker is artistic brilliance. This intense film role will forever immortalize him as one of the most frighteningly malevolent villains to ever appear on screen. Dr. Hannibal Lecter was only homicidal. The Joker in The Dark Knight is portrayed as Bob Kane originally created the character in the Spring of 1940, appearing in Batman #1. Ledger did his homework to develop a Joker that is terrifyingly sociopathic with a real zeal for the macabre. The Joker has a wickedly dangerous sense of humor. His disappearing pencil trick is alarming. He sets a firetruck on fire. Offering more than one origin to his facial scarring, this unnamed criminal mastermind wreaks immense havoc upon the citizens of Gotham City and successfully displaces all of the fear and blame onto The Batman. After demanding Batman unmask himself, The Joker realizes that Batman is his only worthy opponent. When a greedy media hound seeks attention to reveal Batman's true identity live on GCN, The Joker phones in to issue an open public invitation to kill the squealer within 60 minutes. Bravo! Aaron Eckhart is introduced as District Attorney Harvey Dent, a rival with affections for Rachel. Wayne supports Dent's crusade to clean up Gotham City. A wounded civil servant bent on revenge, Eckhart's Two Face arguably upstages Tommy Lee Jones in the role from 1995's Batman Forever. The Joker seduces a vulnerable and broken Dent to avenge the loss of Dawes. In corrupting Dent, The Joker subverts the bond of trust among Dent, Gordon and The Batman. Dent transforms into the disfigured Two Face, determining his illegal activity upon the flip of a double-headed 1922 silver dollar. One strength of a superb actor is to be able to step aside and allow the talent around him to flourish. If The Joker outshines The Batman, that's fine. Bale is quite comfortable in his role. Ledger and Eckhart both exhibit confidence in challenging the eye of the camera. Had Heath Ledger lived to enjoy the accolades of this film, the biggest buzz would still be raging about The Joker. Caesar Romero's 1966 Joker and Jack Nicholson's 1989 Joker both defined their own eras. Ledger embodies the horrifying qualities of The Joker as the ultimate celluloid antagonist.